The census dates, academic withdrawal dates and withdrawal codes for standard and non-standard teaching periods are set out here. You can add these dates to your personal calendar program by subscribing to this calendar. Any changes to these dates will be automatically reflected in your calendar. A subscription link is also availale for each non-standard teaching period category. For help using iCalendar files please view this information. 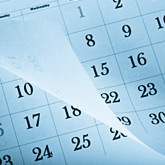 iCalendar (*.ics extension) files are used for online distribution of calendar information. You can subscribe to iCalendar feeds in popular calendar programs like Microsoft Outlook, Apple iCal and Google Calendars. You can also import calendar information to your personal calendar, however subscribing will ensure that any updated information will be automatically pushed to your calendar. Microsoft Outlook (2007 or higher) You will be asked if you want to launch Outlook when you click the subscription link using Internet Explorer, Firefox, Chrome or Safari. After doing so you will need to confirm that you wish to subscribe to the calendar and given the option to rename it. Make sure the checkbox in the Update Limit section is ticked. Apple iCal iCal will launch by default when you click the subscription link in Safari, Firefox or Chrome. You will be asked to confirm that you wish to subscribe to the calendar and given the option to rename it. Make sure you set the Auto-refresh value to "Every day" to ensure you receive any calendar updates. Google Calendar Right click on the subscription link and copy the target URL. Navigate to your Google Calendar and, in the "Other Calendars" section on the left hand side, click the "Add" link. Select "Add by URL" in the menu that appears, then paste the subscription URL in the "URL" field and click "Add Calendar". Please note: Google Calendar does not currently support automatic checking of calendar updates so any changes made to the date information after you subscribe may not show in your Google Calendar. iOS (iPhone/iPad) Calendar Clicking on the subscription link using Safari will prompt you to add the calendar to your iOS Calendar program. Confirm that you wish to do so. Android There is currently varying native iCalendar support on Android OS. Adding the subscription to your Google Calendar (see instructions above) and syncing it with your Android device should enable it to display in your Android Calendar. If you do not have or wish to use Google Calendars, we suggest you download a third party app (ICSSync is one) to manage your subscriptions. 2018 dates are also available.